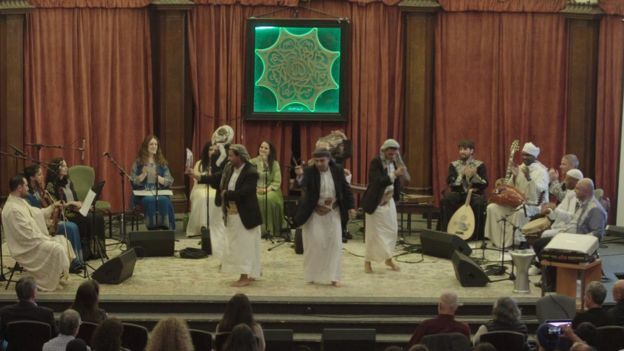 A concert featuring music from seven Muslim countries called Notes Against The Ban was held on the evening of Saturday, March 25 at the Islamic Cultural Center of Northern California in the City of Oakland. Music group The Aswat Ensemble organized the event with support from the Islamic Cultural Center of Northern California (ICCNC), an Iranian Islamic foundation. The Aswat Ensemble directed the event and the MC was a Palestinian woman. 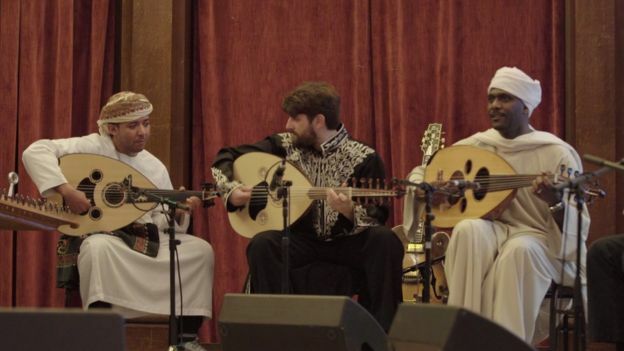 While the event predominantly featured classical and regional music from Arab countries, Persian music was also performed by Iranian artists residing in the area. Perhaps less well-known, these artists put on a stirring performance. We were honored that Oakland mayor Libby Schaaf attended the concert. Mayor Schaaf originally intended to drop by for a brief visit and ended up joining the audience and enjoying the show for over two and a half hours. She told Peyman Amiri, the chairman of ICCNC’s board, that she didn’t plan to stay for so long but the performances were so beautiful and exciting and they reminded her of spiritual music and she watched until the end. After the show, Mayor Schaaf stayed around to speak to other audience members and pose for pictures. In addition, she addressed attendees before the concert began and spoke of the City of Oakland partnering with the ICCNC to put on more cultural events. After her, Reverend Michael Yoshii spoke to the audience about defending Muslims and preventing the spread of Islamophobia in America. 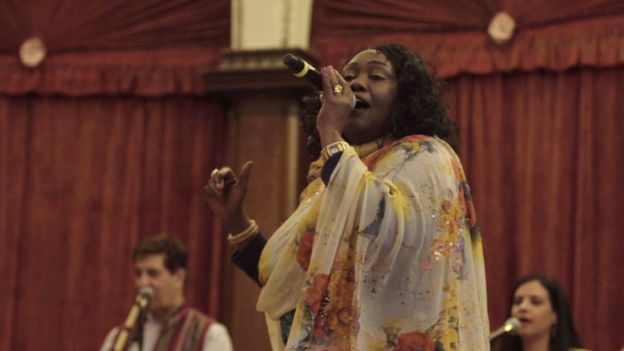 The main part of the event was the performance of famous pieces of music from each country with an emphasis on songs about love for one’s own nation. The lyrics to all the songs were translated into English and projected onto a screen beside the stage so everyone could follow along. Another important aspect to the event was the attendance of members of other faiths such as Christians and Jews who stood side by side Muslims and showed their support for them against President Donald Trump’s Executive Order. Nabila Mango, the Palestinian leader of the Aswat Ensemble which is active in Northern California said that as soon as the debate began regarding the President’s proposed travel ban, the ensemble started thinking about using the arts to voice their opposition to the ban in order to show these countries’ rich, ancient culture and not let the violent acts of a few make us forget about all of their positive aspects. The Aswat Ensemble is made up of bowed and stringed instruments along with percussion. Instruments such as the violin, oud, qanun, and a few types of percussion are also used by Iranian musicians and singers in the ensemble. In addition to Iranian and Arab musicians, some American musicians from the area also played with them. Nabila commended the ICCNC for providing a venue for the Aswat Ensemble. She added that fortunately a strong partnership has been forged. They were able to hold all their rehearsals at the venue itself and she also said that they intend to continue this partnership into the future. Starting at six o’clock in the evening while the concert was taking place, the ICCNC arranged for attorneys to be present to answer questions and provide free legal advice to people who had questions about the travel ban. The excellence of the pieces that were selected and performed by reputable musicians from the seven countries gave us an outstanding, memorable show. A few local networks provided direct coverage of the event and the Aswat Ensemble was invited to perform the show at other cultural centers. Photographs from March 25 show both rehearsals as well as the performance itself.